Devon Camilleri represented both sides. BRING YOUR HORSES HOME! Horse Ranch with 3200 SF 5 Stall Show Barn, Wash Bay w/Hot Water, Satellite Radio, Feed Rm w/Fridge/Epoxy Floors, Stall Mats, Auto Water, 2 Turnout Paddocks, Riding Arena, Round Pen w/Lights/Sprinklers, Vinyl Fencing, Work Shop. Single Story Ranch home w/ travertine & wood laminate flooring, Kitchenaid appliances, Oak Cabinets, Covered Patio w/ TV & Built-In BBQ for entertaining & dining. 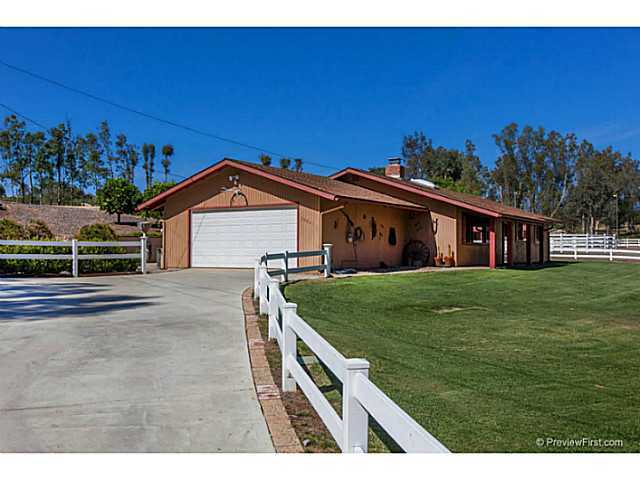 This facility has an electric gate entrance & plenty of parking for your horse trailer, etc., This ranch style home is situated under a canopy of California Oaks and the entire property is gated with 6 ft perimeter chain link fencing. This facility is immaculately maintained and well organized for training or breeding with 2002 5 Stall Silverado Barn (4-12x16 & 1-12x24 foaling stall w/auto water & lights, corner feeders & stall mats in each, 12x12 Feed Rm w/ Epoxy flooring, 12x24 Tack Rm w/drop ceiling and 12x16 Wash Bay w/hot water, XM radio with external barn speakers). The 100x125 arena has 3 rail, 4 ft high vinyl fencing with compacted dirt base and 4' sand topping. 50 Ft Round Pen has 4 rail vinyl fencing w/4' sand base, 4 halogen lights and automatic sprinklers. Pasture turn-outs are 60x60 and 60x90 with lights, solar electric hot wire & 18x18 shelters w/automatic misters, each has pasture feeder, auto water & sand footing. Includes 12x24 work shed w/lights.